Shot timers are small devices that can be clipped on jeans while shooting. It helps in improving the shooter’s shooting speed during his/her practice. These devices display the total time in between individual shots that you have fired or shooters refer as the, “shot string”. A shot timer can help you monitor your shooting progress whether you can hit the target successfully in a short period of time. These devices are famously used in various shooting sessions and competitions that requires shooters to measure and compare their skills. The shot timer automatically triggers itself to record once it has heard loud gunshot sounds. Each shot timer makes a tone that gives a cue to the shooter to start hitting the target. In this review, we are going to reveal the best shot timer that could get you the top of your dollar. Pro II Timer is one of the most reliable and best shot timers available in the market today. It is highly programmable and functional. It is lightweight and perfect aid for shooting. It comes with a button on the side, which makes it accessible when you are ready to shoot. It produces a high pitch tone that lets you effectively hear it even if you are wearing an ear protection. The item only weighs 12.8 ounces, which makes it very comfortable for the shooter to wear during his/her shooting sessions. The battery can last up to 20 hours, which is long enough so you can complete your training. It comes with an auto-shut off feature, which can help you conserve its battery energy. 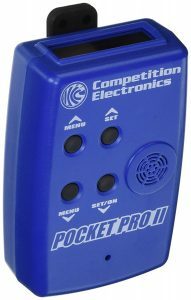 Pocket Pro II comes with a 2-year warranty, which guarantees that it is durable. It comes with an intuitive menu and easy navigation feature that are easy to learn and remember. The shot timer comes with a large button that is positioned with an appropriate distance that is perfect for shooters that have bigger hands. It is powered by a 9-volt alkaline battery which you can easily find a new replacement. The shot timer has a long battery life, which helps you have longer training sessions when you need to. The Pro Shot Timer is one of the standard shot timer options that is suitable for both left and right-handed shooters. It comes in blue color with a simple display of time of the shooter’s shot string. It only weighs around 4.8 ounces, which sometimes make shooters feel like they don’t have shot timers with them. It carries a simple design with easy operational functions. 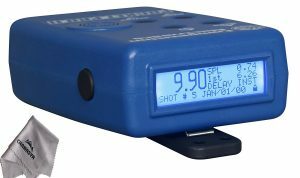 This Pro Shot Timer has the feature to record up to 50 shots in its history function. It lets you review your time whether you’ve got faster or not. This helps in working out your shooting skills and how you handle malfunctions. The buzzer of this sensor is in a sharp and high tone which helps it extremely easy for you to pick up the cue on when you can start shooting the target. This is an important feature since it orients the shooter with a recognizable tone even if they have an ear protection with them. The problem with some shot timers is that they produce low-pitch tones that do not really give a quick cue to the shooter when they are on headphones. It comes with a simple display that gives you the total time of the individual shots released. The shot timer comes with an auto-off feature, which helps you save its battery life. If the timer is not used in 10 minutes, it will automatically shut off. This can be a very useful when you are moving spot for your shooting session. It comes with an alternative buzzer that you can use instead of the tone if you ever you prefer the buzzer type. This shot timer can display 199.9 seconds which can help you track real progress. The Pocket Pro Timer II is one of the popular and one of the best shot timer that you can find in the market. It comes with a reasonable price and it is made with high quality and durable materials. The gadget is easy to operate since the buttons come with labels above them. The user-friendly experience feature of this pro timer put the shooters at ease. This is a good item that would help you improve your shooting skills during your practice time. The item is in blue color and comes with an auto-off after 10 minutes of inactive usage. It displays the numbers big enough, so you can effortlessly see the numbers. It picks up the loud shots of other shooters if you are in a training area where there are many people practicing. Is having a shot timer really worth investing for? Both experienced and expert shooters will account that having a shot timer can help you in improving your shooting pace. Old school hunters will tell you otherwise, they believe that it’s better to improve your shooting without relying on a tool. We say, if you are up for tracking your progress and recording them, a shot timer is definitely worth investing for. How can I pick the best shot timer for my practice sessions? It’s difficult to tell if you are improving on your time delivery of your shots without a tool. The shot timer can be a very efficient and helpful equipment to do the job for you. This section of this whole shooting timer review article will be about the features, functions, and factors that you have to consider before buying a shot timer. You can’t expect for a tool to efficiently work out for you if you aren’t even comfortable with the item’s display feature. The screen contains all information that you need to track your progress. A shot timer is a tool that lets you record the time of each of your shot. It provides important details that help you improve in your daily training sessions. 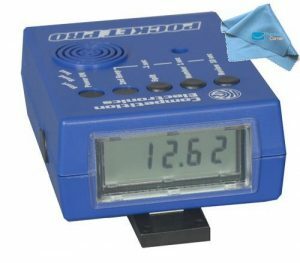 If possible, consider buying a shot timer that comes with LED backlight, so you can easily see the numbers even if you are practicing a bit late at night. Some of the shot timers that you see in most shot timer reviews have incredible data storage, while some don’t have a reliable recording process. This feature is important since it helps you take note of your speed and your shooting skills. One of the most important factors that you need to consider so you can pick up the best shot timer is that is must have a reliable recording process feature. This will aid you in your training sessions. Every shooter needs to have a reliable battery life that could keep up with his/her training process. If you are the type of shooter who moves from one place to another, then you will need a shot timer that has long battery life. On the other hand, if you like staying in one spot or somewhere in your yard where you can safely deliver shots, then a standard battery life would be in your favor. There are shot timers that require being charged every single day. Always tailor your shooting training lifestyle of your shot timer. When we speak about shot timers, most of these items can last for years. Some could even last for a decade. If it has immersed deep in water- its efficacy might deplete over time. Most shot timers are over a hundred bucks. Always stick to your budget when picking your shot timer. Shot timers can come in different designs, features, colors but they are only created for a common function and that is to record the total time and between shots you released while shooting your target. If you are heading forward to improve your skills, then this would be a great aid to get your shooting skills to the next level.